I made two orders through them. One went fine and the succulent garden was nice. However, the second order was never delivered. They said they would resend it. Then called and told me what I ordered was no longer available so they refunded me and gave me a $15 gift card. 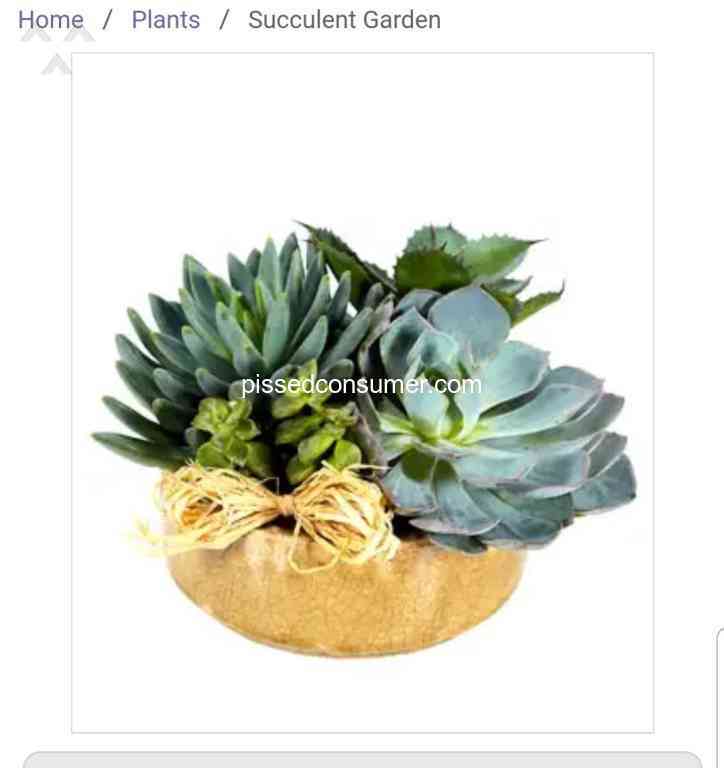 I placed an order for another succulent garden and used the gift card to get the "deluxe" version. Which I assumed would be like the first order only better. IT WAS NOT. It looked horrible and was NOT worth the up charge. After over a week of trying to figure this out I was extremely disappointed. I contacted and the best they could do was apologize and give me a 20% refund. Will not be using them again. Ordered for my mother’s 70 th birthday. Not what was advertised came. There was suppose to be a happy birthday sign. But no sign and not at all looking like what was ordered. I contacted company and was offered 25% off. Not worth it. Wish I had read reviews before purchasing. Scam. Okay. 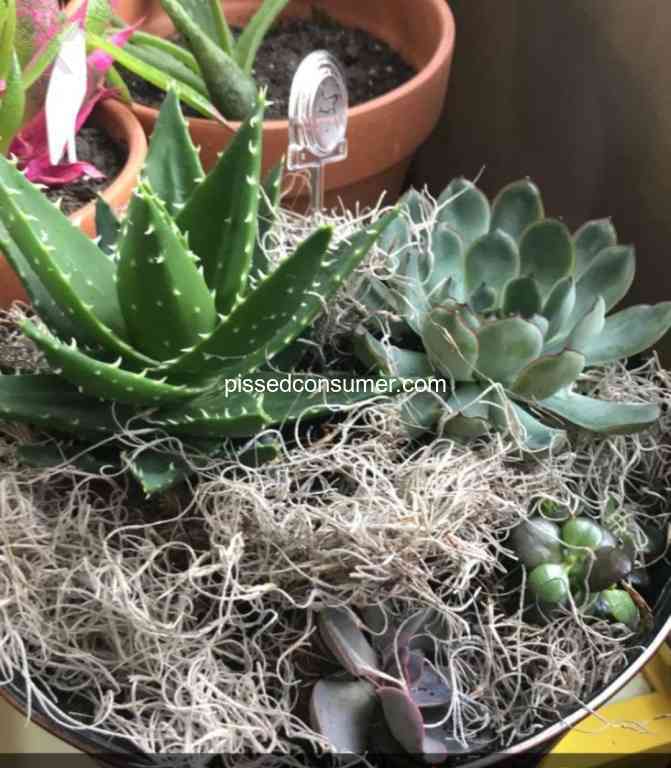 I posted a scathing review after my daughters birthday arrangement never arrived, no phone calls answered and no reply to my emails asking for help. This morning, her flowers showed up This is not her birthday. However, they did finally arrive, a day late, and they are fresh, vibrant and exactly what i ordered. She sent me a photo and they are lovely. So I wanted to acknowledge that. I'm an honest person and they did finally arrive. However, I will never do business with this co again. 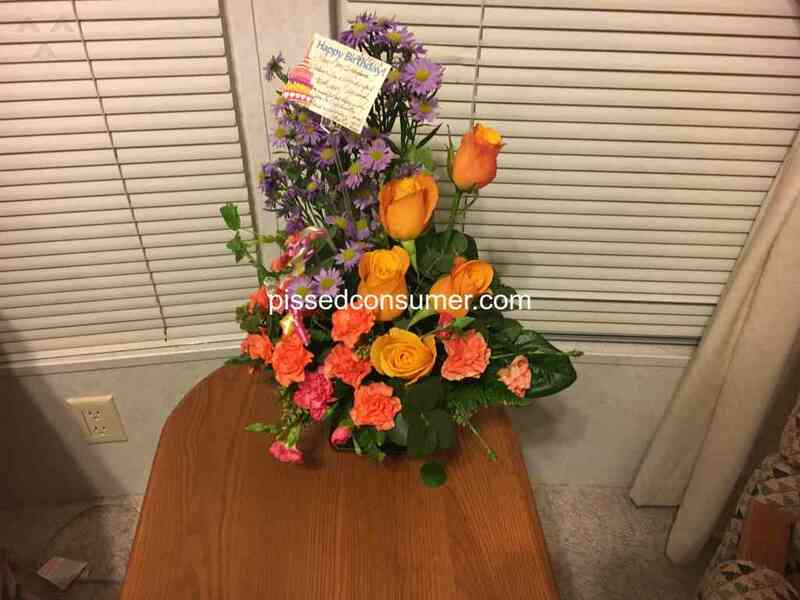 Ordered flower for my 91 y/o mother. An email was sent to me stating that they were delivered. I do not where were they delivered. My Mother sure as heck hasn't received them. Get to speak with a young lady called Aliah and she tells me that I have to call UPS because it was delivered through them. You chose UPS not I your responsibility is to insure that the item gets delivered at the rite place and on the right date. WHY DO I HAVE TO CALL UPS? I was mortified with what was delivered (LATE) she had to stay at work later to get HALF the flowers I ordered. Poor excuse for a flower service touting customer satisfaction. I feel ripped off and embarrassed on my 28th wedding anniversary. I will never use this company again and frankly I think I deserve a refund. 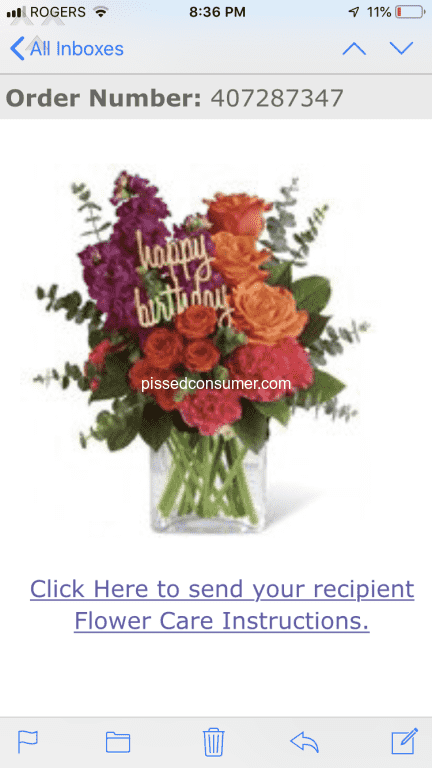 Or at the very least some kind of compensation for getting insulted when the flowers finally arived late and being half the amount of flowers advertised. I paid over $71.00 for 7 roses and 6 carnations. When the picture showed over 25 flowres from just one side. If you value your hard earned money and chairish the person your trying to express your love to then do your self a favor and use another company any other company. My husband ordered flowers for Valentines Day. Even paid extra for AM delivery. Turned out as a NO SHOW. Customer Service was nonexistent. We never got resolution. BOYCOTT this company Their a rip off! I’m not going to put a big back story or go on a rant. Bottom line: DONT ORDER FROM HERE!!!. Just don’t do it. Have a good day. Showing a delivery date of today, but it's now 9pm. They are a total no show.